I have organized birding tours in West Papua for several years now. 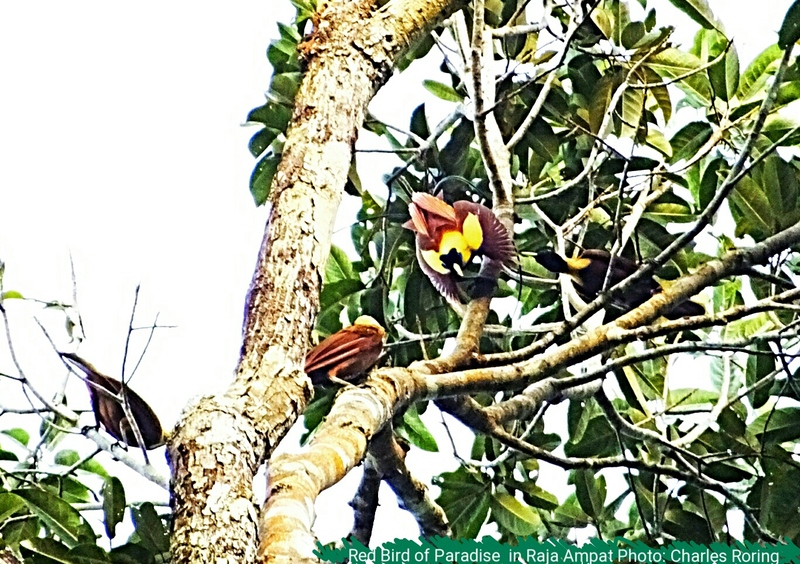 Most of the visitors come to watch paradise birds. One of the most favorite destinations is Raja Ampat. There are two species that are known to science, i.e. Red Bird of Paradise (Paradisaea rubra) and Wilson's Bird of Paradise (Diphyllodes respublica). There are a lot of places that we could go to watch the Red BOP. One of them is in the forest of Waigeo island. 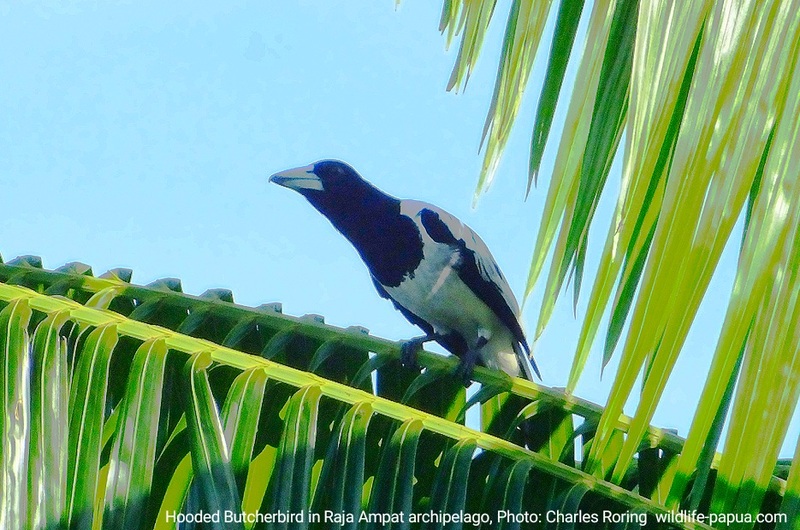 This year, I run several birding and snorkeling tours to Raja Ampat. To watch the birds, we have to wake up at 04.00 in the morning. We need to make some preparations such as preparing our clothing, hiking shoes, binoculars, camera and food. After having some tea and biscuits, we need to walk up slopes for approximately 45 minutes to reach the birding ground. Local villagers have build a birding platform made of wood. The raised wooden structure is 4 meters tall and is suitable for photographers who want to take pictures of birds. Birds are usually active from 06.00 to 09.00. Male Red Birds of Paradise call their female counterparts and compete one another to win the heart of the female birds for mating. They perform their best courtship dance to impress the female birds. Red Birds of Paradise look similar to Lesser Birds of Paradise but they have got red feather. To watch Red Bird of Paradise, visitors need binoculars. I highly recommend the ones manufactured by Zeiss, Swarovski or Nikon. The size can be 10×42 mm or even the 12×50 mm. There are also binoculars that are made by Chinese companies and are offered in more affordable prices. I personally use a pair of Visionking 10×42 mm binoculars. They are not the best in the market but they are good enough for birding and wildlife watching. So, if you plan to enjoy birding, don't forget to bring good quality binoculars to enhance your birdwatching experience. I have just completed a 2-week birding tour in West Papua province of Indonesia. The main target of this tour was birds of paradise. Three visitors from China, and Australia participated in this tour. We spent 6 days in higher and lower montane forests of Arfak range, 5 days in Klasow valley and 3 days in Waigeo island of Raja Ampat. We also heard the sounds of Twelve-wired Bird of Paradise but were not able to see it. Birding in the rainforest of West Papua was relatively difficult particularly for those who were not accustomed to hot and humid climate of the rainforest, the steep slopes, muddy path and numerous insects. In higher montane forest of Arfak range, we stayed in a simple but comfortable guesthouse for 4 nights to watch Magnificent B.O.P., and Western Parotia. In lower montane forest of the range, we stayed for one night in tents that were built in the middle of the forest. We had to walk up steep slopes to reach our basecamp and did birding the next morning. The site where Lesser Birds of Paradise gathered and danced was approximately 20 minutes walk from our basecamp. After watching the Lesser BOP, we continued our tour to watch King Bird of Paradise that day. It was a nice experience because we could see both of them. Despite the hardships that we faced during the trip, we consider that it was a successfull journey. In addition to birds of paradise, there were also other animals that we saw such as soa-soa monitor lizard, wallaby, northern cassowary, snake and colorful butterflies. Glowing mushrooms, wild flowers and unique plants attracted our attention too. In the final leg of our birding tour, we stayed at wooden bungalows in Raja Ampat that were built on the water. We spent 3 days/ 2 nights there to watch Red Bird of Paradise and Wilson's Bird of Paradise. Raja Ampat is a tropical paradise for marine lovers. After hiking and birding in the jungle, we could jump into the sea and enjoyed swimming and snorkeling just in front of our guesthouse. A lot of tropical fish such as damselfish, anemonefish, striped surgeonfish, and butterflyfish thrive in the coral reef of the island. To enhance the birding experience of the participants, I provide binoculars and spotting scope for them. They brought their own D-SLR cameras that were equipped with telephoto lenses. There were a lot of other birds that we watched in the jungle such as Brown Cuckoo-Dove, Lowland Peltop, Yellow-billed Kingfisher, and Hooded Butcherbird, Palm Cockatoo, Sulphur Crested Cockatoo, Pinon Imperial Pigeon, and Golden Myna. Some were sitting on lower branches of trees whereas many on top of high trees. We spent the last three days of our trip staying in wooden bungalows on the crystal clear water of Raja Ampat. It was an unforgetful experience because we could enjoy swimming and snorkeling over pristine coral reef of the archipelago. 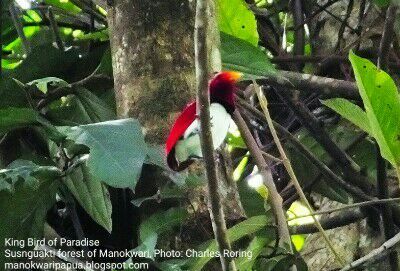 If you are interested in taking a birding tour in West Papua, please, contact me by email to: peace4wp@gmail.com or send text message to my whatsapp number: +6281332245180.